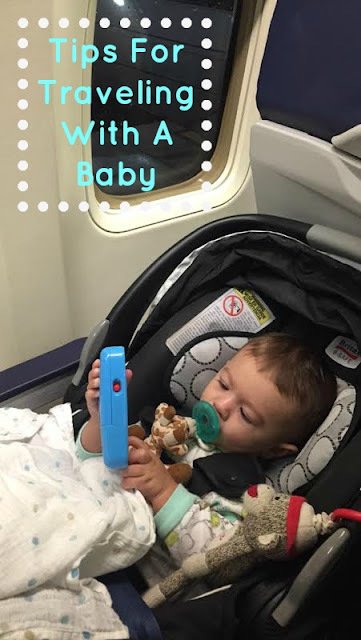 Today I wanted to share some tips for traveling with a little one! More specifically, flying. Let's be serious, it can be overwhelming to think about...from the flights and connections, to time spent in the car, to nap schedules, to what to pack and what not to pack, etc. BUT...the more you plan ahead, the better off everyone will be! Happy and stress-free parents = one happy baby, am I right?! I am definitely not an expert in this area so please remember these are just little things that have helped us! (1) Book nonstop flights if you're able to do so. Do you really want to worry about a connection (and potentially missing your last flight due to a delay) when it's your little one's first time flying? Heck no! Nonstop is the way to go..totally worth it. (2) Decide if you want to bring your baby's car seat on the plane or go the lap baby route. Weigh the pros and cons of both and what situation your baby would do best in. You can purchase a ticket for your baby through your airline (which for us on our last trip would be the same cost as one of our tickets) that will allow you to have a guaranteed seat for your baby in their car seat, or you can just plan for a lap baby (free until they are 2!) but check at the gate before boarding if your flight isn't full and ask if you can bring your car seat on, without having to pay a fee. Sometimes you can get lucky that way, but just know that if the flight is full you won't be able to bring it on. If your baby is pretty calm on your lap and sleeps well in your arms, then you should go the lap baby route. If you want to be extra safe and have a baby who does great in a car seat and takes good naps in it, then you should try to bring it on or book them a seat. Camden doesn't sleep well in our arms but will take a good nap in his car seat, so having the car seat with us on the flight made ALL of us more relaxed and it went so smooth! (3) Gate check the stroller (and car seat if you don't bring it on-you can also check it for free with your luggage) We bought this car seat protector bag-I would definitely buy one to protect your car seat from damage. We loved having the stroller with us up until having to board the plane because it was an easy place for Cam to sit (and be contained so our arms were free!) and we could also walk him around the airport if he got bored or restless. (4) Pack a baby carrier! I've heard a lot of people like to wear their baby in the carrier through the airport instead of having them in a stroller, so that would be your personal decision which you think would work best for your family but definitely pack one for your trip. We didn't find the stroller to be an inconvenience going through security (they just check it quickly and I carried Camden through with me) but we just packed our Ergo 360, which I'm convinced is the BEST baby carrier ever, and it came in handy so many times. We took a lot of walks on our trip (the beach, to the pool, etc) and just wore Camden in the carrier. So helpful! (5) Pack your baby's clothes in big ziplock bags. I put shorts in one bag, swimsuits in another, sleepers in another, and so on. This made unpacking/finding things so easy. Also, I would recommend putting most of baby's clothes in a carry-on, so that you don't have to worry about the airline losing their bag. (7) Use pacifier clips to hold toys! Just to minimize things dropping all over the gross plane floor. (9) Pack books in your diaper bag...books are great because they are quiet but can entertain for longer periods of time. Also, download episodes of Mickey Mouse Clubhouse (BEFORE you get on the plane) on your iPad! If baby is fussy and nothing else is working, Mickey Mouse it is! (10) Nurse/give bottle(or paci) on take off and landing - this will help your baby's ears adjust! (11) Utilize baby/child rental companies (like Baby's Away) - you can actually rent baby items (high chair, pack and play, crib, bouncer, walker, etc.) through them instead of having to worry about packing them. I've heard great things about doing this - just look on their website to see if they are available in the city that you're traveling to! (12) This might be the most important - WORK TOGETHER WITH YOUR SPOUSE AS A TEAM! When one of us would be feeding Cam...the other one would be packing up his bag for the pool/beach. When one of us would be changing him...the other would be getting his bottle ready. It's all about teamwork! This helped us get the most out of our days and made us feel less stressed! Oh, and don't forget a copy of your little one's birth certificate for flying! On our one flight they did ask for it, but the other flight they didn't so I guess it just depends but you don't want to be without it if they do ask. You've always got the in-flight alcohol menu to order from! But I didn't suggest that. Nope. Never. These are great tips! I would be so nervous to fly with our babe, but everyone that has done it says it's not as bad as it seems. As long as they are occupied and happy! Great idea to book a direct flight! Your vacation looked like so much fun! Makes me want to plan one for our family! This is definitely a helpful post! We fly a lot to see family and all these things are true! Love the idea to pack clothes in ziplocks. I always find it so difficult to keep all his teeny clothes organized when we go away!